Gerardmer Lake is located in the town of Gerardmer in the Vosges. 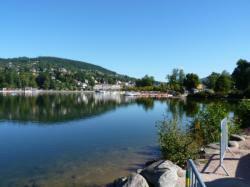 Fed by four rivers, the lake of Gerardmer flows into a river : the Jamagne which itself flows into the Vologne. Located 660 meters above sea level, it is 2200-meter long and 750-meter wide, with a maximum depth of 38 meters and a volume of 19,510,000 cubic meters. Surrounded by mountains and forests, the site provides many activities like water sports, boat rides and pedal boats, and of course swimming. A marked footpath is available for long walks. A pleasant spot to discover in the Vosges! Info: Located on the edge of Gérardmer Lake and 2 km from the city centre, L'Echo du Lac offers a traditional-style restaurant overlooking the lake, a bar and en suite rooms. You can relax on the terrace. Info: Hotel Manoir au Lac is a large, elegant villa nestled in a peaceful and verdant area in the rolling hills near Lake Gérardmer . Info: Residence Plaisance offers furnished apartments in the Lorraine region of France. The apartments have a balcony and kitchen. Free parking and Free Wi-Fi are available. Info: This inn is located just a few steps from the Lake Gérardmer. It offers rooms overlooking the lake with private bathrooms and TVs, and some with balconies. Info: This resort is located on the banks of Lake Gerardmer in the Vosges region. It offers free Wi-Fi and rooms with a view of the lake or the surrounding forest.